While the world had been at war for almost three years, Wilson had been able to keep the United States out of the action. Then, with the resumption of unrestricted submarine warfare by Germany and the collapse of the three-hundred year old imperial government of Russia, the US was forced to enter the fray. 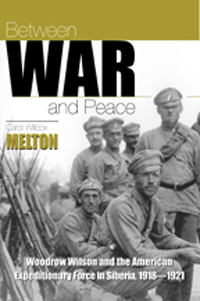 In a novel move, Wilson sent the AEF into Siberia to prevent war by limited military action if necessary and to encourage and maintain peace. The idea was that this military action would allow a popular government time to evolve and take control. US policy of limited military intervention in order to permit the establishment of democratic governments began with the AEF in Siberia, a policy still in use as we enter a new century.